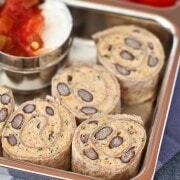 A classic boxed meal, made healthier and heartier. And guess what? It’s not that much harder to make! 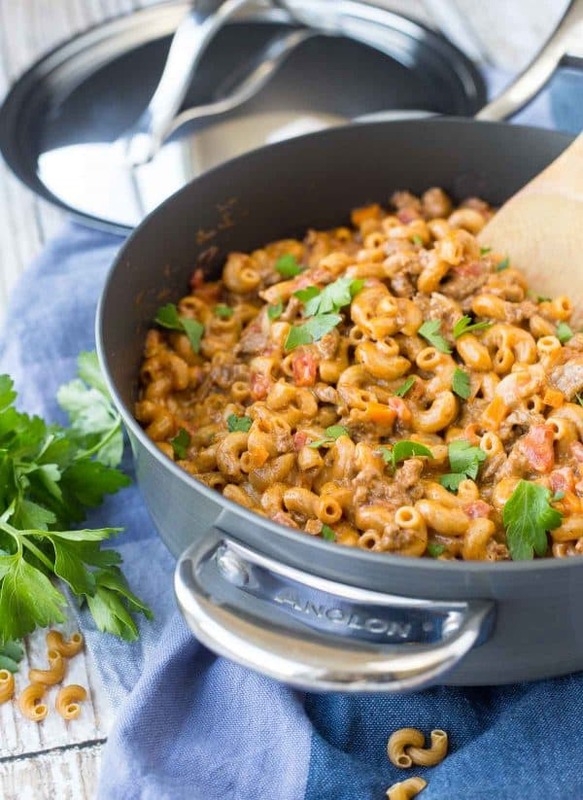 Your whole family will love this healthy homemade hamburger helper. I’m not going to lie, I don’t think I’ve ever made real Hamburger Helper. Maybe once or twice in college. It does, however, frequently happen that there’s a pan of something I threw together with whatever I had in the fridge. You can do amazing things with meat, vegetables, and a grain. The options are limitless. Ben is used to ending up with some type of “slop” on his plate and asking, “What’s in this?” Seriously, that happens at least once a week, and it’s far better than it sounds. It’s not an “Oh boy, what’s in this?” It’s more of a curiosity type thing. It’s recognizable, even to someone who never eats it. Maybe he ate it growing up, but I know for a fact he hasn’t had it in at least 8 years. As I often do, I made this version a little better for you. 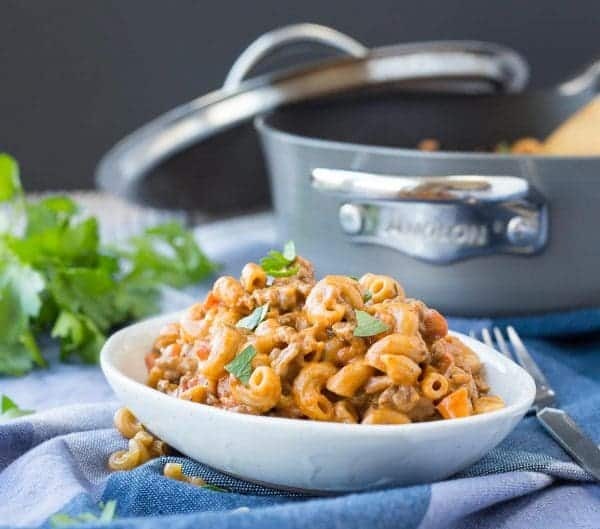 Coming in at 479 calories per (generous) serving, it’s definitely not breaking the calorie bank, especially given the fact that it’s a pan full of pasta, beef and cheese. Paired with a salad or fruit, it’s a hearty meal you can feel pretty good about. And did I mention you can make it in 30 minutes? That’s not much longer than the boxed kind would take, I’m assuming. That 30 minute thing is important amidst the craziness of the holidays. My editorial calendar is looking like I’m bringing you guys more quick and easy meals this December than I am cookie recipes. I have plenty of great cookie recipes in the archives, but we do have to eat something besides cookies this month, right? This meal is actually perfect after a day of baking. You’re exhausted, I know you are — we all are! Make dinner easy and good for you. You got this! 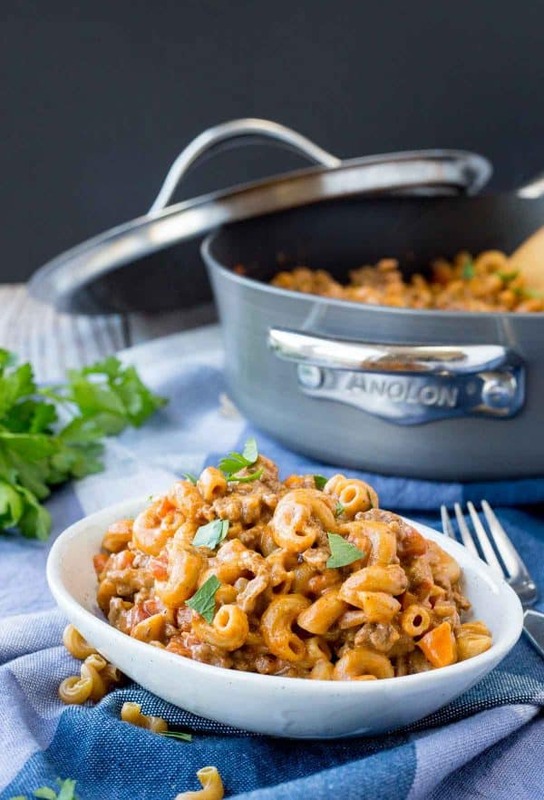 As I’ve done in the past, I’ve partnered with Anolon® to bring you this easy recipe. My cupboards are full of Anolon cookware and I know it’s a brand I can always count on. I find that I’m often inspired by a good piece of cookware. It encourages me to get in the kitchen and try something new because I can’t wait to put it to use. The pans have comfortable handles and are heavy enough to not be sliding around on the stove, but not so heavy that you break your back when you’re trying to wash them! 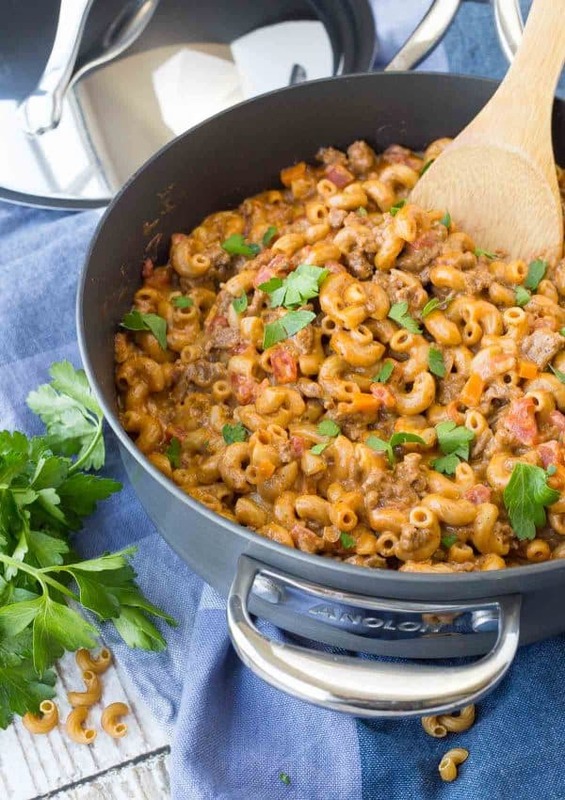 Watch this video to see how to make homemade hamburger helper! 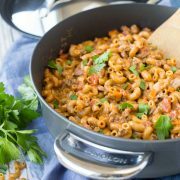 Homemade Hamburger Helper - Whole Wheat! In an Anolon 3-Qt Covered Sauté pan, heat olive oil over medium-high heat. Add ground beef, onion, and carrot and cook until beef is browned and onions are translucent, breaking up beef as it cooks. Add tomato paste, flour, chili powder, paprika, parsley, brown sugar, garlic powder, salt and pepper. Keep stirring until tomato paste coats all the meat. Make sure to keep stirring so the tomato paste does not burn. Add tomatoes, water, and milk and bring to nearly a boil. Add pasta, stir, reduce heat to medium, and cook covered for 6-8 minutes or until al dente stirring occasionally to make sure pasta gets cooked evenly. Reduce heat to low and add cream cheese and cheddar cheese. Stir until cheese is melted. 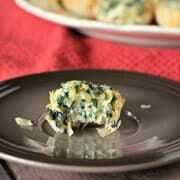 Serve immediately topped with fresh parsley if desired. Note: I recommend using whole milk because milk with lower fat percentage tends to curdle at a higher heat, which you need to cook the pasta. If you don’t have it, you could use 3 cups (total) water and increase the cream cheese to 4 ounces to add creaminess at the end. Note: If you wish, you could use ground turkey instead of ground beef. Verdict: Comforting, filling, and flavorful. 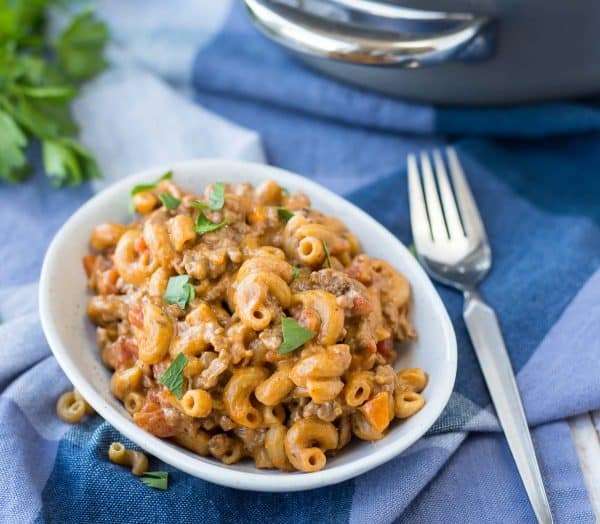 We’ll be having this homemade hamburger helper often! Husband’s take: He loved this and ate a huge helping two nights in a row. Changes I would make: None are necessary but I frequently get a little vegetable-happy so I might be throwing in more veggies next time, probably bell peppers and spinach. I made it and it seems a bit soupy after adding all the liquids. What am I doing wrong? The liquids get absorbed by the pasta as it cooks so it will be liquidy until it is finished cooking. Omg this was amazing and super easy to make! Took zero effort and was so good that my husband couldn’t wait to have it again as leftovers. And this man NEVER eats leftovers. Thank you so so much!! Oh yay! 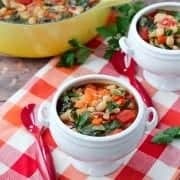 I’m so happy to hear you liked this recipe! And hooray for a leftover victory! Thanks for taking the time to come back and leave a comment! Homemade are always the best! Rachel I grewup on hamburger helper in the 70’s . It’s so nice to have a home made recipe to enjoy all over again, thank you xoxo. This looks like a winner. I can’t wait to try it!